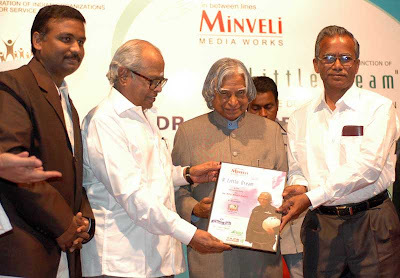 Last week, a documentary on Dr Abdul Kalam was released at Chennai. The documentary has been produced and Directed by Mr P Dhanapal, CEO, Minveli Media Works. Mr Dhanapal is a great admirer of Dr Kalam. His mission is to spread the message of Dr Kalam across the Nation amongst the youth. As a single person, he devoted more than 30 months in the production of this documentary by collecting various information, materials on Dr Kalam. He was taking the guidance of Dr Y S Rajan (co-author of the book India 2020) and Mr Ponraj (presently Advisor to Dr Kalam) for the authenticity of the information. The 60 minutes English documentary film was released at Chennai last week by Mr K. Balachandar, doyen of Indian film Industry, in the presence of Dr Kalam. I have seen the documentary fully. I donot find words to appreciate the enormous work that has gone behind this production. This is a 'story in story' type. A grand father tells his grand son about the greatness of Dr Kalam. In the process, speeches of Dr Kalam at various places, including that of European Union have been included. Right from the childhood of Dr Kalam at Rameswaram till his Rashtrapathi Bhavan days are visualised in an interesting manner. At the end, you don't feel that you have spent one hour on this. Mr Dhanapal has given this New Year gift to the Nation. 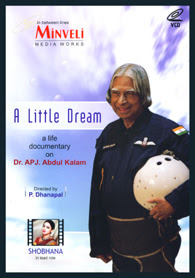 Inorder to ensure that Dr Kalam's message spreads acorss the Nation, he has priced this VCD, so low at Rs.50/-. This VCD can be used as 'gift' to youth during any memorable occassions. This can be screened in the Schools and colleges. We have taken an exclusive interview (9 minutes 40 sec) with him. Please listen to his interview by clicking to play. Please also watch the trailer of the documentary given below. Hi this s srinivasan . i have still not watched but i have ordered for a copy . i read in news paper about the documentary film . i was so surprised to know about this , this will bring a new episode of students life .